Anyone who claims to be an aviation afficianado in Canada had better know who George Beurling is. For those who don’t know (and shame on you for it) Beurling was Canada’s highest scoring ace of World War II. It’s somewhat embarrassing that everyone reading this will likely know of Americans Chuck Yeager or Bob Hoover, yet very few will know of one of our own national war heroes. But Brian Nolan has done a very creditable job of trying to remedy such ignorance. Nolan’s book, published in 1981, chronicles Beurling’s life from beginning to unexpected end and tells the story of a classically tragic figure. It is the story of a very young man who gladly sought, received, and excelled at, the job of airborne assassin. It is also the story of someone who seemed able to do little else. Beurling grew up in Verdun, Quebec and was smitten with flying very early on in life. He was a typical airport kid who traded odd-job labour for flying lessons. He soloed at age sixteen in the summer of 1938, and with only ninety minutes of solo time was teaching himself aerobatics. 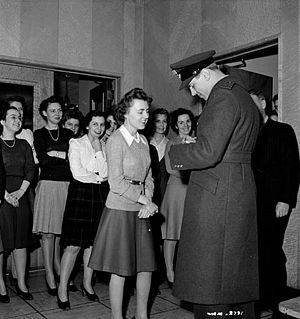 Helen Fowler, while other female employees of the Aluminum Co. look on. But Beurling was an eternally restless sort, not cut out for the routine of day to day life. He eventually tried to enlist in the RCAF, and was rejected. 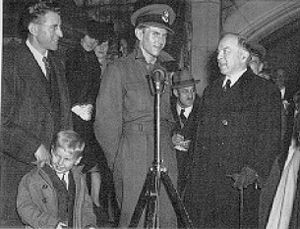 But he found a home in Britian’s RAF in the early part of the WWII where he became a constant thorn in the side of just about everyone around him, especially his superiors. 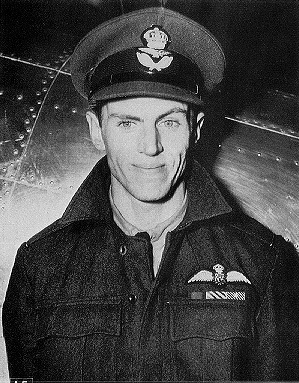 Beurling was eventually transferred to Malta where in just a few months in the summer of 1942 he shot down nearly thirty German and Italian planes before being shot down himself. In the section of the book covering Malta, Nolan reveals what a master technician and tactician Beurling really was. He had an almost computer-like ability with numbers, angles, closure rates and other factors essential to air combat. Yet he was sullen and solitary on the ground. And he was still constantly running afoul of his superiors. Nonetheless, it was in Malta that George Beurling earned his fame, and he would later remark that his time there, though desparate and dangerous, was the best time of his life. After the war Beurling seems to have done very little more than have a long term affair with a New York socialite (he was married and separated at the time). In early 1948 he signed on with the fledgling Israeli air force as a mercenary pilot. In Rome, in May that year, Beurling was on his third circuit of a refresher flight in a Noorduyn Norseman bush plane. The plane caught fire and crashed and burned, killing Beurling and the check pilot. My only complaint with Nolan’s biography of Beurling is how the author seems unable to view Beurling through the eyes of a flyer (not surprising since Nolan is not a pilot). Though clearly a book about an aviation figure, “Hero” was not written for an aviation audience. Nonetheless, “Hero” is a well researched chronicle of an intruiging and little-known Canadian. Nolan has talked with those who knew Beurling at different stages of his life and has woven these anecdotes together with official data to tell a compelling story. He presents Beurling as an endless dichotomy of talent and inner turmoil. If the author is to be believed, George Beurling’s tragic flaw seems to have been his ability to achieve greatness, yet his inabliltiy to accept its accompanying responsibilities.